See our separate camouflage showroom for this growing fashion rage of knit camouflage clothes for the entire family from camouflage knit baby clothes to our unisex camouflage sweaters, camouflage knit caps, and camouflage cargo pants in our online knitting catalog! Every cottage industry knitter knows the importance of their "bread & butter basics" These are usually the items that are quicker to knit and popular selling items. The Knit Tree's bread and butter items would be the Knit Native hats and beanies, and knit scarves and the several styles of Winona Camo beanies, hats and baby blankets.
! This Showroom offers you a wide selections of hand loomed knits and gifts that are basic to everyone's needs. We have added a special Showroom of Yarn Kits and Patterns to satisfy the requests from so many hand knitters and machine knitters that want to knit bread and butter basics, baby clothes, fashion garments and home decor items themselves! We've just gotten started so come back often to see what surprises are in store for you! Right now there are patterns and kits which include unique fibers such as lycra along with the pattern books that give information on how to use the lycra or determine the selling cost of your knit projects. Check out our special promotion: Buy a pair of the Three Generation Knit Slipper and get the choice of the free knitting pattern for hand knitting or knitting machine! 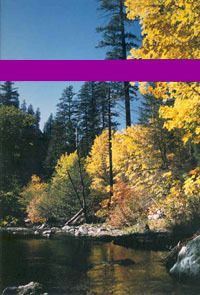 or to go directly to the online catalog page for that image! Our little baby loves his Winona Camo Ridgerunner hat that matches Daddy's camo hat. 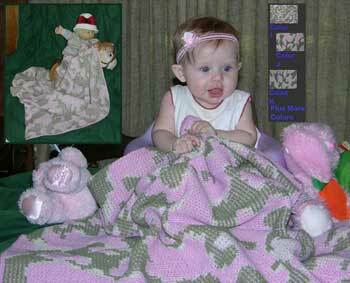 Our acrylic Knit baby blankets, beanies, and booties are all knit with the Winona Camo design. Choose between several different color ways to make matching custom knit camouflage gifts for baby, toddler,child, mom and dad. We appreciate your feedback, so contact us if you would like to see other camo colors like marine camo, forest camo, woodland camo, snow camouflage, or desert camouflage - especially knit for older children or adults. 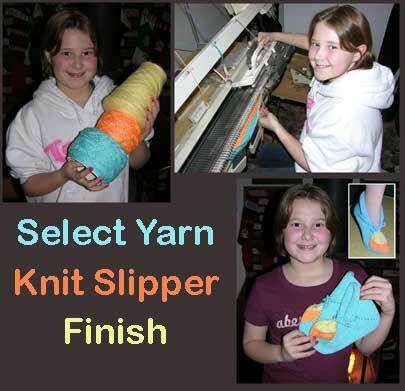 "The Three Generation Knit Slipper"
This Little Knitter makes colorful knit slippers, plus get a free knitting pattern for the slipper. This 10 year old Little Knitter selected her yarn colors of turquoise, orange, and yellow and prepared them for knitting on the knitting machine by winding them with a yarn winder. Then she learned the additional knitting technique to change colors for the toe on this bulky knitting machine. Finally she gets to hand finish her slippers and pick a name for her color combination. It was a tough choice between Tropical Sunset and Sherbert Ice cream for this pair of knit slippers. Also, see what she did for her Wine and Roses knit Slippers We are soooo proud of all our Little Knitters! You can encourage these " Little Knitters" by entering our store and examining their knit products. These knit slippers make great inexpensive gifts. I love to use them as prizes at baby showers or a special gift for the expectant mom: a set of slippers for mom and a matching set for baby! The best thing about the basics category of knitting is that these patterns begin with the basic knitting techniques and progress into more advanced techniques as the different projects evolve. they encourage the knitter to expand their horizons, think for themselves and enjoy the creative process of adding fibers and colors to their projects. We hope you enjoy the basic knitting projects and support our knitters as they grow into creative artisans. Go to our online knitting catalog Bread and Butter Basics category to see hand loomed and knit basics by all our our designers! Lots of knit camouflage clothes, knit baby clothes, knit slippers, and more ~ all hand loomed with quality in mind ~ are available just for you! Content, articles or photos on this site may not be used without permission.